Looking forward to spring and cherry blossoms! 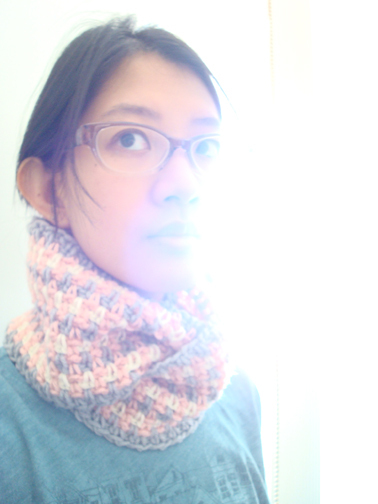 A cozy circle scarf pattern for Lunar new year! :D You know, in Chinese Lunar New Year is also called 春節, which literally translates into “spring festival” in English. I’ve been seeing this combination of stitches (single crochet, chain one) in different projects around the web, have also used it in my bucket hat pattern for a basket weave kind of texture. Recently I was making a circle scarf for a friend and figured that when arranging rows of colours in certain ways it actually looks kind of like plaid. It’s made with a larger hook so it’s quite soft. 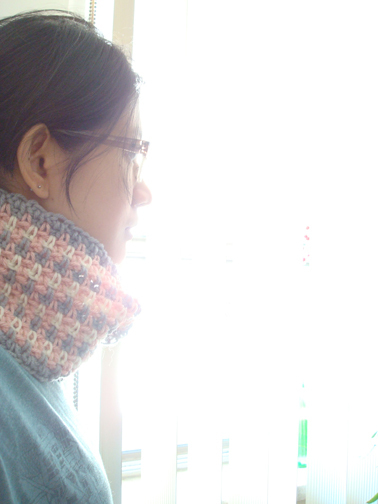 With grey and larger hook, ch 130 (you can ch more or less to adjust the length. Mine wraps around my neck twice snugly. Just make sure that there is an even number of stitches). Being careful not to twist, sl st in first ch to form a circle. 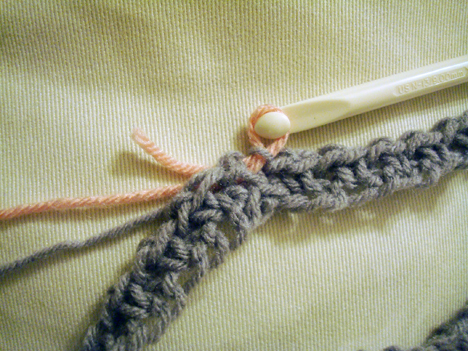 Tie the short end of pink to the working yarn (grey) to secure it. 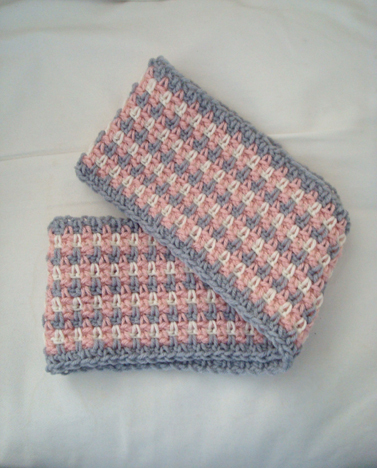 Row 2: with pink, TURN (be sure to turn the work at the beginning of each row, otherwise the pattern will look slanted). sc in first ch 1 sp, ch 1, *sc in next ch 1 sp, ch 1* repeat from * to * to end, sl st in first sc of row while changing yarn to white. Row 3: with white, TURN, carry up the other two colours of yarn and wrap them in the first sc in first ch 1 sp, repeat row 2. With subsequent colour change, yarn‐over with the new colour as you make the sl st at the end of the row, TURN, then carry up the other two colours and wrap them in the first stitch you make with the new colour in the start of the row. Let go of the other two colours as you go around the scarf. 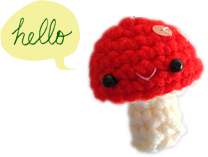 With smaller hook, weave in ends. Keep warm until spring arrives! I’ve been seeing that stitch a lot lately too! I love the colors you picked, really pretty! !